The dry, gritty garden soil unfriendly to so many plants meets its match in compact, daisy-flowering gazania (Gazania rigens). Perennial in U.S. Department of Agriculture plant hardiness zones 9 through 11 and a summer-blooming annual elsewhere, gazania carpets the ground in radiant shades of white, pink, yellow, orange and red. When its faded flowers are removed to promote new ones, gazania provides nearly non-stop color. 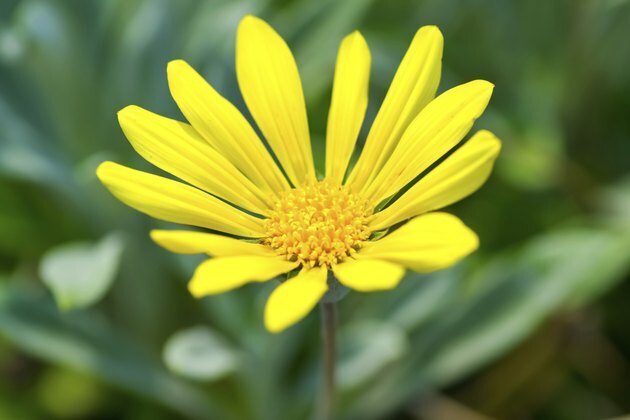 To take full advantage of its trailing habit, grow the South African native -- commonly known as treasure flower -- in rock gardens, border edgings or containers. A gazania growing in South Africa. Give your garden treasure flowers a site with at least six hours of daily sun. They're great plants for sandy or gravelly, relatively infertile soil. The only soil they don't like is a heavy, slowly draining one. To create a solid blanket of color, space your plants 12 to 18 inches apart. Covering the bed with a 2-inch layer of organic mulch such as ground bark discourages weeds while the roots establish. Container treasure flowers do best in a light, porous growing medium formulated for succulents or cactus plants. If you prefer, make your own potting mix of 2 parts loam and 1 part each of coarse sand and peat moss. Use pots with drainage holes, and set the plants 6 to 9 inches apart at the same depth they were growing in their nursery pots. Crown or stem rot from overwatering is a leading cause of death among treasure flowers. To avoid these problems, keep the soil or medium consistently moist, but never wet, while the plants adjust to their new location. After they begin putting out new above-ground growth, water them thoroughly. Then let the top 3 inches of soil become dry to the touch before watering again. Container plants overwintering indoors need watering once weekly, or whenever the medium is completely dry. Excessively fertilized treasure flowers produce lots of lush leaves and very few flowers. Garden plants don't need any fertilizing. For container plants, a single spring application of continuous-release, 13-13-13 granulated fertilizer is sufficient. The amount of fertilizer varies with pot size. Give treasure flowers in a 10-inch container about 2 tablespoons, or the label's specified amount. Sprinkle the granules evenly around the plants, mix them lightly into the top 1 inch of medium and water well. Other than water-related crown or stem rot, disease seldom bothers treasure flowers. Powdery mildew, a patchy, white or grayish fungus, occasionally affects plants growing in too much shade. Prune and dispose the mildewed leaves, disinfecting your tools in rubbing alcohol between cuts and after use so they don't spread the problem. Prevent new outbreaks by sprinkling the remaining foliage lightly with water so spores landing on them won't germinate. Various leaf-spot fungi also attack treasure flowers. Remove the blemished leaves and keep the soil free of potentially infected debris. Leaf-spot disease needs a moist environment, so keep the plants dry when you water. Like diseases, most insects ignore treasure flowers. The rare exceptions are mealybugs resembling mounds of white wax or cotton fluff on the stems and leaves. They drain sap and excrete gooey, transparent waste called honeydew. To control them, mix a solution of 1 quart of rubbing alcohol, 4 teaspoons of ready-to-use insecticidal soap and 1 gallon of water. Spray until it drips from all the plants' surfaces, and repeat daily or every other day until the bugs are gone. Can I Plant Zinnias in Pots?